I got the base recipe from Ricardo’s website, so please check him out here! Sometimes I find pastry cream can be a bit eggy or have a floury/corn flour taste but this recipe is really smooth and rich without either those attributes. I have flavoured this cream with cocoa powder, Grand Marnier, orange blossom water, cardamom and many others. This time I went more classic, with some fresh lemon zest, vanilla bean paste and a splash of dark rum. Please enjoy! 1) Whisk the eggs, sugar and flour together in a bowl. 2) Warm the milk until steaming. Temper the egg mixture slowly. Return mix to the stove. 3) Cook on medium-low until the mixture comes to a boil, reduce heat and cook until it thickens, about a minute. 4) Put into a container. Add lemon, vanilla and rum. Cover in cling film to prevent skin from forming and put into the fridge to chill, around 2 hours. 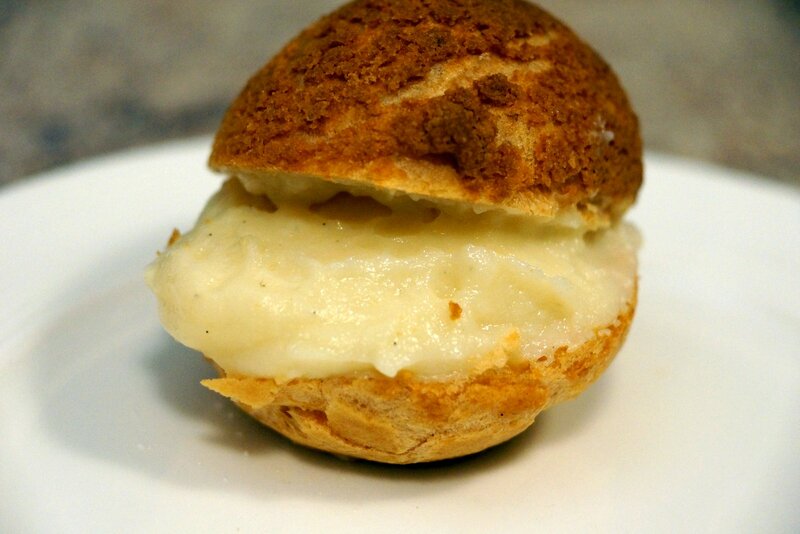 5) Fill choux chells, tart shells and top with fruit, or eat with some fruit and nuts in a bowl.